A spectacular Japanese Maple for sale in classic oval ceramic bonsai pot. This would look perfect on a patio or a feature on the decking or by a garden pond. The incredible exposed roots lead the eye upwards to a powerful, commanding and gnarly character trunk. This supports beautiful branches and has a wonderful taper. The overall canopy of lovely palm shaped leaves is stunning. The leaves change colours from greens, gold, yellows and oranges depending upon the season. The photos really do not do justice to this wonderful bonsai. 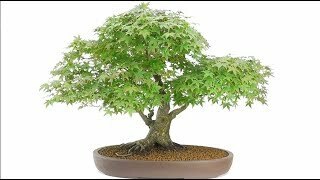 This is a very easy and well established specimen bonsai; making it ideal for beginners. A Bonsai Direct care handbook will be included. Please see the video below for a better visualisation. A truly breathtakingly beautiful specimen Japanese maple (48 years) bonsai. The nebari (root flare) is exquisite. The photographs do not do this incredible bonsai justice. Bonsai Pot: Classic oval unglazed ceramic bonsai tree pot.